Possible causes of screen problems such as screen flickering in mobile devices including Samsung's newest Galaxy S6 Edge and S6 Edge Plus, would include mis-configured display settings, corrupted apps, and worst, hardware damage. For brand new Galaxy S6 Edge and S6 Edge Plus devices with screen flickering issues since the first day of use, asking for a brand new/replacement unit is highly recommended, given your device is still under warranty. Contact your phone carrier immediately, if the screen problem persists after performing soft resets or phone restarts. It could be an indication of a faulty hardware that needs to be fixed. 1. Soft reset your phone. Press and hold the Power and Volume Down buttons until the phone powers off completely, and then turn it back on after 30 seconds. See what happens after doing that. 2. Power up/Restart in Safe Mode. Try to boot into safe mode. Booting into safe mode can help you determine if the problem is caused by a third-party application or not. If the problem is gone while in safe mode, then you need to locate the faulty app and have it uninstalled or temporarily disabled. There are some users who experienced the same problem and fix it by simply uninstalling an exclusive automatic update on certain apps. With the phone turned on, press and hold the Power button until the phone options prompt displays. Touch and hold Power off until the Reboot to Safe Mode option displays. Upon restart, Safe Mode should appear in the lower-left of the home screen. If the problem fails occur, the cause has been isolated to a third-party app and so all recently installed or updates apps may need to be temporarily disabled to identify the culprit. To exit Safe Mode, just reboot your phone. 3. Make some adjustments to your phone's display settings. If your screen is flashing, try to deselect Adaptive Brightness from the phone settings and see what happens. Go to Settings >> Display >> Brightness. Deselect the option "Automatic/Adaptive brightness". Hint: Browsing through webpages with the screen brightness set to a lower or lowest level can sometimes cause the screen to flicker. Another trick that has done wonders to some is by going to Settings-> Developer Options-> and remove then check from the box next to Show screen updates. It's a temporary solution that works. 4. Check battery status and calibrate the battery. 5. Contact and escalate the issue to your phone carrier for further assistance and recommendations. 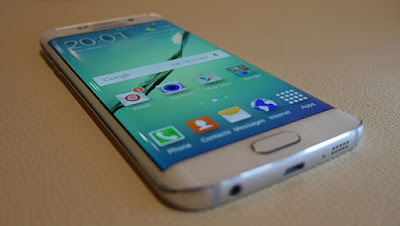 The aforementioned procedures are applicable for Samsung Galaxy S6 and S6 Edge Plus models.